I don't need a soul anyway. Last edited by TheMinim on Wed Sep 10, 2014 12:26 pm UTC, edited 1 time in total. Titled TheMinimastic as of NP 1610. Official owner of NewPage 1572, and official co-owner of NewPage 2087 along with NoMouse. Is this the first time we have a view of what's clearly the back of an xkcd character's head? Ah, old Ba'al, the soul-eater. Also known as He Who Let Down His Priests. Maybe he's calling from that trip he went on! Ba'al?? Really... where's the humor in that? Ba'al was the ancient god they sacrificed infants to. It was the idol of Carthage and look where they ended up. Whatever he does, he should probably not try to find out who this Ba'al guy is with his phone. If you can read this, you are wasting your time. Eutychus wrote: Is this the first time we have a view of what's clearly the back of an xkcd character's head? 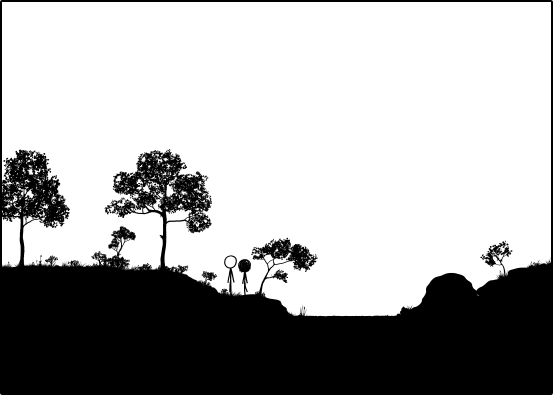 Well, it's in silhouette, so I don't know if it counts. I do agree that the shape implies it's the back of her head, though. Re: 1419: "On The Phone"
Never keep your hammer in the fridge. It should be kept in the oven, at 200°C (400°F, gas mark 6), which maximises the strength of the steel by optimising the balance between plastic yield and brittle failure. orthogon wrote: Never keep your hammer in the fridge. It should be kept in the oven, at 200°C (400°F, gas mark 6), which maximises the strength of the steel by optimising the balance between plastic yield and brittle failure. What about when your fridge looks like this inside? Came for the GOOMHR comments; found none. Will order velociraptor next time. And death to any who dare suggest (re my first sentence) that I should W___ F__ I_ . And for goodness sake, if someone asks you if you're a god, say YES. Wait, people actually use phones to talk? My "phone" is my personal gaming device that also allows me to hear voicemail messages from people. If I ever actually talk on my phone, something has gone terribly wrong. Umm... Ba'al just means "lord". For example, Baalzebub is "lord of the flies". The soul devourer is going to be pissed. Introbulus wrote: You'll need this hammer. Ah, the table I linked to was only for various steels, copper and bronze. I couldn't find corresponding figures for mithril or whatever Norse gods' hammers are made of. 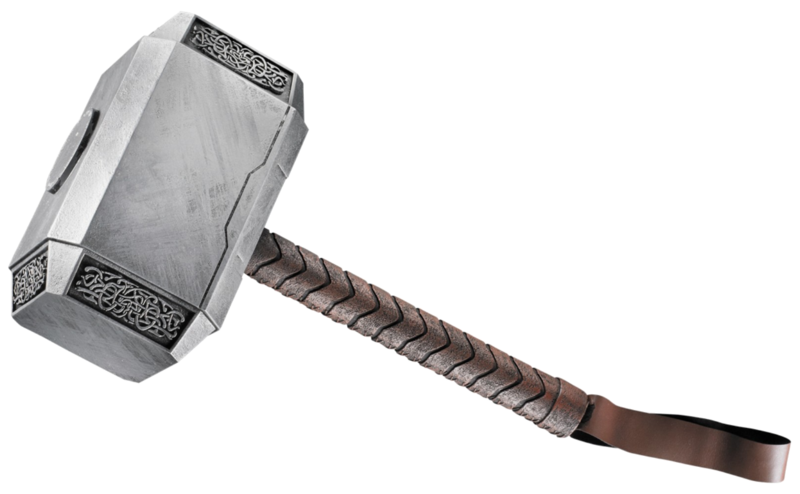 Thor's hammer, from Marvel, is supposedly made from a neutron star. Whizbang wrote: Thor's hammer, from Marvel, is supposedly made from a neutron star. Which, not surprisingly, is nothing like the original myth. Brokker and Eithri forge it using their 31337 Dwarf Skillz, but Loki shows up as a stinging gnat, causing Brokkr to drop the bellows for a moment - hence the short handle. Only earth-sourced materials ( mineral and organic) were used. cowpi wrote: Ba'al?? Really... where's the humor in that? Can you narrow it down further? Because that's a lot of gods. Well, that.. sorta helps. At least we have a region now. There's still.... a hell of a lot of gods there. I wonder if I do this? I do find things in odd places in my house - TV remote in food cupboard is a common one - but I thought the most likely explanation was elves and fairies mischievously moving things around. Perhaps it's really me, when I'm on the phone. That's possible. I'm still suspicious of the elves and fairies though. No, no no no. It is not made from a Neutron Star, it was forged using a neutron star. It is made of Uru, a fictional Asgardian material. And at 42.3 pounds, it's lighter than an aluminum hammer of the same dimensions. This is why you do not listen to Astrophysicists when they talk about comic books. Because they may not know what the hell they're talking about, what with Comics and Astrophysics having nothing to do with each other. Plutarch wrote: I wonder if I do this? I do find things in odd places in my house - TV remote in food cupboard is a common one - but I thought the most likely explanation was elves and fairies mischievously moving things around. Perhaps it's really me, when I'm on the phone. That's possible. I'm still suspicious of the elves and fairies though. I kept finding the TV remote in the kitchen, too. I finally worked out how it happened. I'd put some food/drink on a tray and take it into the front room (where the TV is) and put it on the coffee table. Then at some point I'd use the remote and put it down on the tray (the tray completely fills the coffee table so there's nowhere else to put things down). Then later still I'd take the tray back into the kitchen and if not concentrating would "put the remote away" somewhere, maybe on top of the microwave. Working this kind of stuff out is made much more difficult than it ought to be owing to the difficulty of setting breakpoints in Real Life. Finding the TV remote in the freezer is the example I use to illustrate the two different meanings of the English word "why". When you ask "Why is the remote in the freezer? ", you may be expecting an answer where "why" means "what for", such as "keeping the batteries cold makes them last longer". And you may instead get an answer where "why" means "how come", such as "I must have had it in my hand when I went there to get an Otter Pop". Other languages have two different words or phrases for these two meanings. TheMinim wrote: I don't need a soul anyway. Whenever I'm on the phone, I just bang on a keyboard randomly. One day, I'm going to write Shakespeare, but we'll just have to settle for this forum post for now. da Doctah wrote: Finding the TV remote in the freezer is the example I use to illustrate the two different meanings of the English word "why". I always leave my phone in the bathroom. First off, I don't think Norwegian has two words for it either - though, interestingly in my eyes, our word translates to 'where for', so apparently we've not moved on from the 'wherefore art thou romeo' time linguistically. I consider those unspoken parts to be the actual answers, the spoken part is just the context - but because in those two cases the context is more important, it's a better idea to just communicate the context, rather than just the actual answer. I tend to agree. I think the distinction is more between the mechanism by which something happened (which is indeed closer to "how? "), and the intent of some sentient agent in making it happen. da Doctah's two answers aren't different options, since they couldn't both apply in the the same situation. I would offer instead "because somebody put it there" for my first meaning and "to make the batteries last longer" for the second. The Otter Pop example is devoid of any intent at all; it was an absent-minded mistake and therefore not really different in kind than if a freak gust of wind had blown the remote into the freezer: there is mechanism but not intent. Personally... I prefer Ammut the Devourer. Not the only time in Time, either. At least the last three seem to translate fairly well to English "why" questions. The last two you've all been discussing at length enough, but also questions like "Why is this x?" can mean "What exactly is it about this that makes it qualify as x?" Seems like "How is this an x?" also accomplishes that same effect. I'm not sure I've ever heard an English "why" question (or "how" for that matter) that amounts to an inquiry into the material cause of something. These different senses of the word "cause" were famously expounded upon by Aristotle as "the four causes". Canine deities are always chasing Ba'als. John McEnroe really hates us. He's a Tennis Ba'al. He's always raising a racket when we chew on him. There's no love there. Pfhorrest wrote: I'm not sure I've ever heard an English "why" question (or "how" for that matter) that amounts to an inquiry into the material cause of something. I'd say that questions about the qualities of an object tend to imply questions about material cause in English. For example, why is ice less dense than liquid water? implies what is the structure of ice?, or more generally, what is the material difference between ice and liquid water? This only works in a philosophical system in which we assume properties of objects arise from material causes, but I think that is by now commonly accepted. Interestingly, I think we can get three out of four meanings for English "whence" as well: in the material, efficient and formal senses, "whence x?" is a reasonable question. Last edited by Mirkwood on Wed Sep 10, 2014 7:48 pm UTC, edited 2 times in total. So to summarize, it's Material, Plague, Fire and Payton... oh sorry, I'm in the wrong thread. Ba'al originally was a word meaning 'lord'(c.f. Akkadian Bel) commonly used as a name for Caananite and other Northwest Semitic deities(often manifestations of the storm god more commonly known as Adad or Hadad), which as a result of references to Baal in the hebrew bible became associated with demonic powers in English usage and in this case is being used as a generic "spooky" name. That's what happens when you post while on the phone! Re: Not the only time in Time, either. CorruptUser wrote: Umm... Ba'al just means "lord". For example, Baalzebub is "lord of the flies". The soul devourer is going to be pissed. If Baalzebub is "lord of the flies", does that mean BaalZFS is "lord of the files"? Interesting story: hebrews used Ba'al as a word for 'lord' or 'god', too. They named their kids things like Ishbaal, which translates to "man of god". Then when 'baal' took on the connotation of a pagan god, the writers of the old testament changed all the names so that they wouldn't have to write 'baal' anymore. Ishbaal became Ishbosheth (which means "man of shameful things". Poor Ishbaal. ). That is according to the footnotes in my bible; I can't find an online reference so you can believe me or not. I remember writing some "demo" program on the Archimedes years ago. We had some working code but we wanted it to be able to return but then carry on from where it left off next time it was called. Rather than build some complex state machine, we cooked up some horrendous kludge whereby it would do a call to some other routine that would somehow save its stack and restore the original stack and carry on; then next time it would switch back to the saved stack and "return". It worked, but we felt at the time that this was the work of the devil, and since the "jump to subroutine" instruction in the Arc's RISC assembly language was "BL" (Branch with Link), we made a label "zebub" so we could write "BL zebub". Years later I came across the concept of coroutines, which is more or less exactly what we were doing. I'm still not convinced they're a good idea, though.